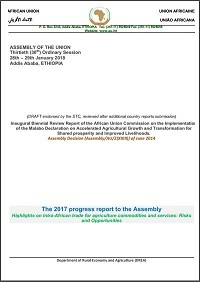 Inaugural Biennial Review Report of the African Union Commission on the Implementation of the Malabo Declaration on Accelerated Agricultural Growth and Transformation for Shared prosperity and Improved Livelihoods. In this Report, twenty-two (23) performance categories and forty three (43) indicators have been defined, for the seven (7) thematic areas of performance aligned to the commitments to evaluate country performance in achieving agricultural growth and transformation goals in Africa. This has been done through a continent wide consultation process. The “Inaugural Biennial Report on the Implementation of the Malabo Declaration” fosters alignment, harmonization and coordination among multi-sectoral efforts and multi-institutional platforms for peer review, mutual learning and mutual accountability. The Member States’ performances are presented in a form of a “Country Scorecard in implementing the Malabo Commitments” covering the period 2015 - 2016. The report aims at strengthening national and regional institutional capacity for agriculture data generation and knowledge management which will, not only support improved evidence based planning, implementation, monitoring and evaluation, and learning; but also set basis and paths for triggering continental actions programmes to collectively drive agriculture transformation in Africa. The findings and recommendations of the Biennial Report should, therefore, allow AU Leaders to appreciate the amount of efforts required to strive towards the set targets for 2025 in the Malabo Declaration, and then endorse the appropriate collective actions to accelerate agricultural growth and transformation. The report highlights the inclusive nature of the process and methodological approach that was used to collect and analyse data and develop the report. Furthermore, the report also presents the key findings at continental and regional levels, the detailed profiles and scorecards of individual countries, and sets of recommendations for individual countries, regional bodies and continental institutions. African Union Commission (AUC) ,Addis Ababa, ETHIOPIA.